I have posted several kinds sisig in this blog and I think this version is not very different from the rest. The only thing you will notice is the simplicity of the ingredients. That’s right, simple ingredients is what an authentic Kapampangan sisig is. There is no mayonnaise or eggs mixed in the sisig which is I think only here in metro manila this has become popular. The recipe here is only using grilled pork cheeks and chicken livers, onions, salt, pepper, calamansi juice and red chili peppers. 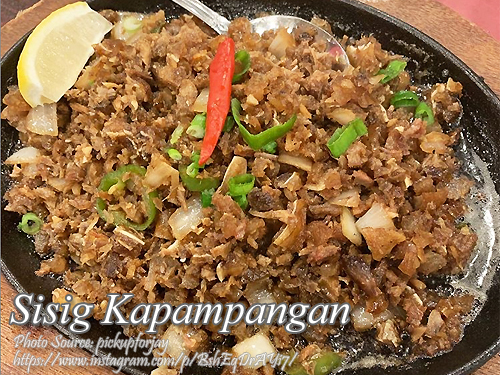 So if you are in search of a simple yet tasty sizzling pork sisig, and like to cook it in the Kapampangan way, I think you should try this one! Blanch the pork cheeks and remove hairs or other impurities. Then put in a pot with boiling water and boil for 20 to 30 minutes. Then remove from the pot and drain. Set aside and cool. Clean the chicken livers with running water and remove the bile if there is any and other impurities. Skewer in bamboo sticks and grill together with the pork cheeks. Grill until brown and crispy. Then remove from the grill and cool. Chop into very small pieces the pork cheeks and the chicken liver then put in a bowl. In the same bowl add chopped onions, salt, pepper and calamansi juice. Mix thoroughly until all the ingredients are well combined. Heat the sizzling plate on top of the stove until smoking. Add the margarine and melt in the sizzling plate. Then put the sisig on the plate and stir fry using a pair of spoon for a minute. Then turn off heat and transfer the sizzling plate on the wooden tray. Garnish with siling labuyo and slices of calamansi. Serve hot.